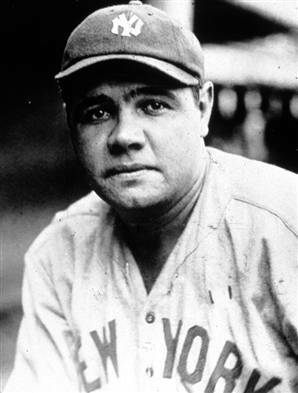 The American League home-run leader with 47 in 1926, Babe Ruth had hit only four in his first 25 World Series games. Then he gave “the greatest exhibition of batting a World’s Series ever saw”1 and become the first player to hit a trio of homers in a postseason game as the Yankees evened the 1926 World Series at two games apiece with a 10-5 triumph over the Cardinals. Following Ruth, cleanup hitter Bob Meusel walked, but when he tried to score from first base on a single to right by Lou Gehrig, a throw from Billy Southworth to Rogers Hornsby to Bob O’Farrell cut him down at home. New York starter Waite Hoyt went 16-12 in the regular season. He was facing the Cardinals for the first time since tossing a scoreless inning against them in his big-league debut as a member of the Giants in 1918. Hoyt’s reacquaintance with the Cardinals quickly turned sour as St. Louis tied the game thanks to a trio of singles by Taylor Douthit, Southworth, and player-manager Hornsby. With men at second and third, Hoyt avoided further damage when he fanned Chick Hafey to end the frame. Tony Lazzeri doubled off Rhem to start the second but, in more adventures in bad New York baserunning, fell victim to a Douthit-to-Tommy-Thevenow-to-Les-Bell relay while trying to stretch his hit into a triple. On a nice play, Bell “made a desperate drive to lay the ball on the sliding Yankee.”4 The last three New York batters had homered, walked, singled, and doubled, but the Yankees had just one run to show for all of these productive plate appearances. Hoyt set down the Cardinals in order in the bottom of the second, and Rhem again retired Combs and Koenig in the top of the third to face Ruth with two outs and nobody on base. “Rhem threw Ruth a slow ball … as big as a derby hat, but the motion was deceptive and the Babe had started a quick swing when he saw that he was shooting too soon. Then, so quickly that you could barely perceive the motion, he pulled back again and took a long, slow swipe. ... He banged the baseball … over the roof of the right field pavilion close to the middle of the park.”5 New York led 2-1, a score that would hold until the top of the fourth inning. With one out in that frame, Rhem walked Lazzeri. Next Joe Dugan lifted one to shallow left-center. As sportswriter Grantland Rice described the scene, “Both Douthit and Hafey started for the ball. They were traveling at top speed after the manner of two taxicabs attempting to cross the street from opposite directions when the collision took place. One had just reached the ball when the other struck him with the force of a tornado.”6 Dugan got credit for a double, and Lazzeri raced home with the third Yankee run. Hank Severeid singled, but Douthit got his second outfield assist in three innings by throwing out Dugan at home. Art Reinhart relieved Rhem but failed to retire a batter. Combs walked and Koenig doubled him in to knot the game, 4-4. Reinhart walked Ruth and Meusel to load the bases, and threw two balls to Gehrig. “Here was the point where Hornsby should have acted,” wrote the New York Times’s James Harrison. “He had Herman Bell warmed up, and it was no secret that Reinhart was now in the clouds. The left-hander steadied a little, but [after] the count was two and two, he walked Gehrig, forcing Koenig in and sending New York ahead” with a 5-4 lead.9 Hi Bell came in with the bases loaded and none out. A Lazzeri sacrifice fly and a Dugan squib to the catcher gave the Yankees two more runs to make the score 7-4. Meusel followed with a single, but Southworth earned his second assist of the game, matching Douthit, by throwing out Meusel trying to stretch the hit into a double. That saved a run as Gehrig followed with a double before Lazzeri popped to short. O’Farrell and Thevenow gave the Cardinals a good start with singles to start the bottom of the sixth, but Hoyt escaped unscathed. New York tallied its final run in the top of the seventh thanks to a Severeid single, Hoyt’s sacrifice, and a double by Combs. Wild Bill Hallahan, a back-of-the-bullpen reliever who walked more than five batters per nine innings in 1926 but who would become a frontline starter for St. Louis in the 1930s and the NL starter in the first All-Star game, in 1933, lived up to his nickname by walking the bases loaded in the top of the eighth, an inning that also featured the lone sacrifice bunt of Gehrig’s 34-game World Series career. Severeid fouled to Les Bell at third, however, to strand a trio of Yankees. The Yankees had relied on heavy hitting to compensate for losing four runners on the bases. New York would ultimately fall to the Cardinals in Game Seven on another aggressive baserunning adventure that failed — when Ruth was caught stealing to end the game. 1 “Ruth’s Great Exhibition,” The Sporting News, October 14, 1926. 2 William F. Allen, “Crowd at Game Today Likely to Set New Record,” St. Louis Post-Dispatch, October 6, 1926 (evening edition). 3 James Crusinberry, “Ruth Gets 3 Homers; Yanks Win, 10-5,” Chicago Tribune, October 7, 1926. 4 J. Roy Stockton, “Yankees 3, Cardinals 1 (3½ Innings); Ruth Hits Two Home Runs,” St. Louis Post-Dispatch, October 6, 1926 (evening edition). 5 Westbrook Pegler, “Finders Is Keepers When the Babe Swings the Bat,” Chicago Tribune, October 7, 1926. 6 Grantland Rice, “Cardinals Crushed as Babe Ruth Smashes Three Mighty Home Runs,” Boston Globe, October 7, 1926: 12; “Douthit played out the game, but the next day was stiff and sore, and Hornsby advised him to stay on the side lines” for the rest of the Series. “Alexander Joins Immortals in Cardinals’ Series Triumph,” The Sporting News, October 14, 1926. 7 “‘I Told You So!’ Huggins Chortles,” New York Times, October 7, 1926. 8 “Radio Description of Fourth Game,” New York Times, October 7, 1926. 9 James R. Harrison, “Ruth Hits 3 Homers and Yanks Win 10-5; Series Even Again,” New York Times, October 7, 1926. 10 Grover C. Alexander, “Alexander Takes Hat off to Babe,” Boston Globe, October 7, 1926: 12. 11 Associated Press, “Spirit of Cards Broken by Yank Attack: Huggins,” Chicago Tribune, October 7, 1926. 12 Wilbert Robinson, “Ruth Really Great, Robinson Declares,” New York Times, October 7, 1926.